Over the past ten years I’ve seen my fair share of web hosting companies come and go. Some good, some bad, and some just down right horrible. Having to find a home for all of my domains has sometimes been a nightmare. A company that might have looked promising last week might disappear and be out of business this week. 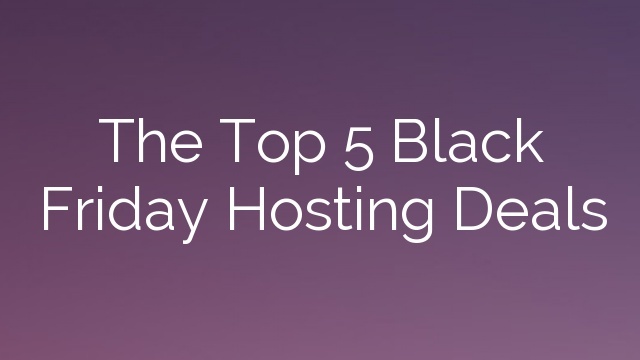 So to save you the time and trouble that I had to go through, I present: The Top 5 Black Friday Hosting Deals. I used Host Gator a few years ago for a pretty popular forum I ran. They had pretty good reviews on WHT (www.webhostingtalk.com) at the time, so I signed up. They offered plenty of bandwidth and disk space, but only allowed you to host a single domain. At $6.95 a month (paid yearly), I gave them a shot. The first month was pretty smooth, but the high price for a single domain was a downfall. I had four other domains with four other web hosting companies… I left Host Gator in search of someone that would host all of my domains for a single price. On Black Friday they are usually running 80% off discounts. Take a look at the Cyber Monday Hostgator Deals to read more. I decided to go with FatCow because they offered reseller plans for $20 a month which allowed me to host all of my domains on a single server. I ended up staying with FatCow for about a year, but then the server I was on started having problems. My sites were constantly down and this went on for more than a month. Apparently other people (on different servers) weren’t having the same issues I was, but it didn’t matter. I went on the hunt for a new provider. FatCow runs a pretty low price all year long, but they go even lower on Black Friday. Inmotion was another site that required me to pay up front for a year, but promised a refund if I wasn’t satisfied. For only $6.95 a month they said I would be able to host all of my domains on a single account. I was pleasantly surprised with Lunarpages. For more than a year I stayed with them, until they ended up banning the forum script I was using for one of my sites. They said the script used up “too much of the system resources” and so I found myself once again hunting for a web hosting company. Inmotion is more on the premium side of the hosting companies. They rarely run discounts but Black Friday is an exception. Usually they run 10-30% off sales. This time I only needed a host that could handle a single site (I had sold off all but one) and Bluehost was looking good. For $6.95 a month I would have everything I needed, but most importantly, they were receiving wonderful reviews on WHT. I was with them for about six months when I decided to leave. I never had a single issue while be hosted by them, I would recommended them to pretty much anyone… so why did I leave? Cost. But prices look much better around Black Friday. Some people will be shocked that I list this as my number one web hosting provider, but I do. I started off using them as a test. They were offering web hosting for $1.99 a month (snatched a Black Friday deal) and you didn’t have to sign-up for a year. I didn’t have high hopes for them, since a lot of people were referring to them as the “Wal-Mart of web hosting companies,” but I figured for $1.99 a month I had nothing to loose. Well, the site I hosted with them ended up becoming pretty popular, with mentions from other sites like Digg (www.digg.com) and Fark (www.fark.com). I figured it was just a matter of time before GoDaddy killed my account… so I waited…. and waited…. until it became quite clear that my site wasn’t going anywhere. They could have easily asked me to move to a dedicated hosting plan, but they didn’t. Two years later I am still using them for all of my web hosting needs and not once have I ever had a problem. The few times that I did have to call for support the customer service representatives were kind enough to talk to me at 3am in the morning and still sound happy. So there you have it. If you are looking +for a reliable, cheap, budget web hosting company, I definitely recommend GoDaddy. I know they have some negative reviews out there, but don’t judge them until you try them.